Every year, there are new authors to meet at the Great Writers Right Here author fair. This year is no exception. I recently talked with a couple of this year’s newcomers to the author fair, Jen Mann and Angie Pickman. Jen Mann is a blogger whose work offers an often sarcastic and hilarious look at life without a filter. In addition to her New York Times best-selling People I Want to Punch in the Throat, she has written or contributed to more than half a dozen other books. 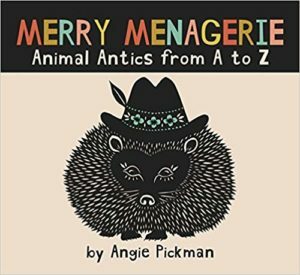 Angie Pickman is a cut-paper artist who recently published her first book, Merry Menagerie, a children’s alphabet picture book. 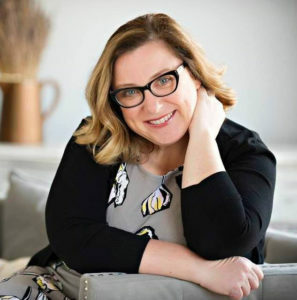 Her work has been featured in Midwest Living and Martha Stewart Living magazines. Aside from attending this year’s fair, what do these authors have in common? From a childhood desire to create, through careers that led them away from their passions, these two women have put hard work into making their dreams come true. 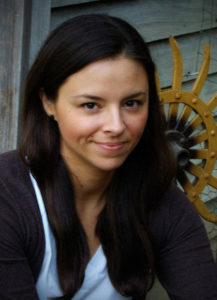 Jen Mann had long held a passion for writing, but she pursued a career in real estate. That opportunity came with a post Mann published on her blog in 2011. A week after putting it on her site, the post suddenly went viral. Within a 24 hours Overachieving Elf on the Shelf Mommies had been read over one million times. After a period full of disbelief, elation and worry, Mann decided to make the moment work for her. “I had a choice to make, do I let myself become a one-hit wonder or do I get to work and try and make a career for myself” Mann said. Pickman had been in a similar place along her path. Though she’d always been drawn to art, she ultimately decided to major in business. Pickman discovered her love for cutting paper while in graduate school, but once she graduated, Pickman went right into business. She opened a restaurant in Brooklyn, New York. When that venture failed, she converted it into a bakery that saw some success. Still, Pickman was an artist. She began to post her work online. The responses she received convinced Pickman there was an audience for her work. Learning from her experiences with the restaurant and the bakery, Pickman realized that “pursuing a passion took effort.” Art was Pickman’s passion. This passion eventually led her back to Kansas and toward a life as a full-time artist. Angie Pickman and Jen Mann will be attending the Great Writers Right Here author fair on Sat, Dec 8. They’ll be joined by more than 40 authors, including some other new faces as well as many familiar ones. Stop by between 1 and 4pm to visit with fabulous local authors and to shop some great books. Continue reading to learn more about Angie Pickman’s artistic process and Jen Mann’s love of art. You’ve long had a passion for writing, but pursued other career paths. During that time in your life, did you imagine you’d one day have a published book to your name? “Imagine” is the right word, because I never really believed it would happen. I’d wanted to be a writer since I was five years old, but I didn’t know how to achieve this dream, so I toiled away at other jobs hoping and dreaming an opportunity would come along. Lucky for me, one did, otherwise I’d probably still be in a cubicle farm somewhere. You became a blogging sensation with a single post that garnered millions of views in a day. What was your reaction? Did you doubt the reality of what was going on? My blog post about the Elf on the Shelf was read over 1 million times in a 24-hour period. It was unbelievable. A lot of emotions go through your head when 1 million people are reading something you wrote. My first thought was, “There must be a mistake” and my second thought was, “It wasn’t my funniest post! Why that one?” I was also quite terrified because I’d never experienced anything like that. I had a choice to make, do I let myself become a one-hit wonder or do I get to work and try and make a career for myself. 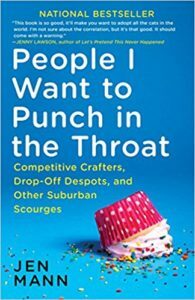 When People I Want to Punch in the Throat was nominated for a Goodreads Choice Award in 2014, it was competing against books written by the likes of Amy Poehler, Neil Patrick Harris, et al. What were you feeling at the time? Were you at all surprised by the results? I was very surprised. I was excited just when it was nominated, but as it made it through each round, I couldn’t believe it. I was a bit disappointed when Amy beat me, but it was expected and I was thrilled it went as far as it did. We can still be BFFs if she wants, no hard feelings. On your website, you mention a love of crafting and art. How serious of a crafter are you? What artistic medium would you most likely choose if you pursued a career as an artist? I spend entirely too much money at Michael’s. My daughter and I work together in our craft room in the basement of the house. We like to try out new things. Right now we’re collaging a lot. Modge Podge is our favorite! But I’ve always enjoyed watercolors, so I’d probably paint watercolors if I were an artist. Art is a form of therapy for me. When I’m stressed out, I tend to end up in the craft room with a paint brush or the glue gun. What’s next for Jen Mann? I’ve just finished the second book in my YA series, My Lame Life, and I’m working on finding it a home. I’ve started a women’s fiction novel and a nonfiction how-to book about blogging, publishing, etc. And finally… What most excites you about participating in this year’s author fair? I’m excited to meet other Kansas readers and writers. You grew up with a love of art, imagined you’d always be an artist, but decided to pursue a career in business. At what point did realize you could be an artist in the present? How has your business experience shaped your artistic practices? I majored in business in college, though I considered majoring in art; however, my college did not even have an art major at the time and I decided business would be a good major that I could utilize in lots of different ways. I ended up going to graduate school where my focus was definitely more art than business, but as soon as I finished, I opened a restaurant! And then I opened a bakery (after the restaurant bombed! )… It was during my long days working in the bakery that I realized I needed art as an outlet, so at night when I was at home, I’d make images that reflected my experiences at that time. I started posting those online and the responses I was getting made me realize that there was an audience for my work. Having opened and closed the restaurant and then running the bakery for several years made me realize that more than anything, pursuing a passion took effort. Art was what I really wanted to be doing so I knew that if I was capable of what I had already done, I was capable of making a go at being a full time artist. Where did the idea of creating a children’s book come from? Do you hope to publish others? I got into my paper cutting craft through experimenting with animation. I love the idea of telling a story with imagery. Since I’ve been making art, I’ve always had the idea that I would like to make children’s books, and I definitely want to publish more. What is your proudest artistic achievement or recognition? I don’t think I necessarily have any single achievement that I’m most proud of. I’m incredibly grateful for all of the artistic accomplishments that I’ve made and for those whose support have made them possible. I suppose I could say that I’m pretty proud of the overall effort I’ve put into my art and the business side of it, as I realize that getting to be a full-time artist is a pretty special achievement. How long does it take you to create a piece? Did the format of Merry Menagerie require you to deviate from your usual approach to your art? The time it takes to create each of my paper cuttings varies based on the size, amount of detail, color, my mood, coffee consumption, etc. I have some tiny pieces that take a couple hours and some of my larger pieces have taken a few weeks to complete. When I created the images for Merry Menagerie, I had the idea that they could someday be a book, but I really created them for a library exhibit with the thought that it would be a fun series for children. I took a pretty similar approach to those as I do my other art, although they certainly required a little more technical thought to come up with both an animal and object to go with each letter of the alphabet. What’s next for Angie Pickman? I have had such a busy 2018 that I’d like to slow down some in the new year and focus on exploring my imagination a bit and seeing what kind of art comes out of it. I definitely would love to do a little bit of animating, as well as start on what hopefully will become my next book. Making a children’s book has been a dream of mine for such a long time, so to be here showcasing my book at this event, amongst so much talent, is such a privilege and an honor. Posted in Books, Movies & Music, Events and tagged Author Fair, Great Writers Right Here, Local Authors.